Kicking off our series of Bike Wardrobe Remix Photo Booth shots from the Disposable Film Festival's bike-in movie are Soraya and Sebastiaan from MyDutchBike.com. Soraya lent us a Bakfiets, long john style, cargo bike (pictured here) to haul our lighting equipment to the event. Thank you! Oh yeah - Sebastiaan has got the LOOK! 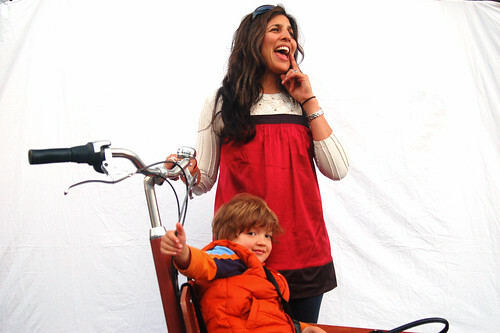 soraya,thanks so much for letting us test the bakfiets! what a great ride. its so great to have mydutchbike.com in san francisco. you and the family and the shop are an urban cycling asset.